I (Brent) am a former student pastor turned public educator. Upon leaving vocational ministry, I moved into a position as a teacher and coach in southeast Texas. I taught science at the seventh and eighth grade levels for seven years and loved it. However fun my science classes were to teach, science was never my passion. My passion is in helping students learn from their choices (good and bad) and grow from one day to the next. During my time that I was in the classroom, I told my students on a regular basis, “My goal is for you to be a better person on the last day you walk out of my class than on the first day that you walked in. If you learn some science along the way, that’s awesome too!” Obviously, I wanted them to learn science and I wanted to do a great job of teaching it to them. After all, that’s what I was getting paid to do and I want to be great at my job. That doesn’t mean that science was my main goal for my students. Like Brent, I (Jeff) spent 11 years as a student pastor before I transitioned into public education. I knew the call into the classroom was about relationships and helping kids to be better today than they were yesterday. Having taught both elementary and middle school students you come to find out that meeting the basic needs of students is universal. I can remember my first year teaching 4th grade, I had a parent of one young man indicate to me that it was the first year in his young school career that he had not been sent to the office. During that year we had several one on one conversations, where being 6’ 4’’ I would crouch down to eye level, and remind him what he could do. I always shared that I expected more because he was capable. The power of high expectations seemed to resonate equally somewhere deep inside this little guy’s mind and heart. We developed a strong relationship by the time the school year finished. Though I was teaching english language arts we were all learning what it meant to live out the art of doing life together – what it means to become better with the help of another. As administrators, the main focus has not changed for either of us. At all. We want our students across the campus to be better people on the last day they walk out than on the first day they walked in. How in the world can that be accomplished in the role of an Assistant Principal? Don’t we just stick them in detention or suspend them from school all the time? Behavioral struggles are something that we all deal with in our professions as educators. Do not get us wrong, mistakes will be made and there are processes in school by which we must follow. However, there has also been much damage done in the name of “enforcing the rules” which had there been a relationship pre-established would have potentially turned out very differently. 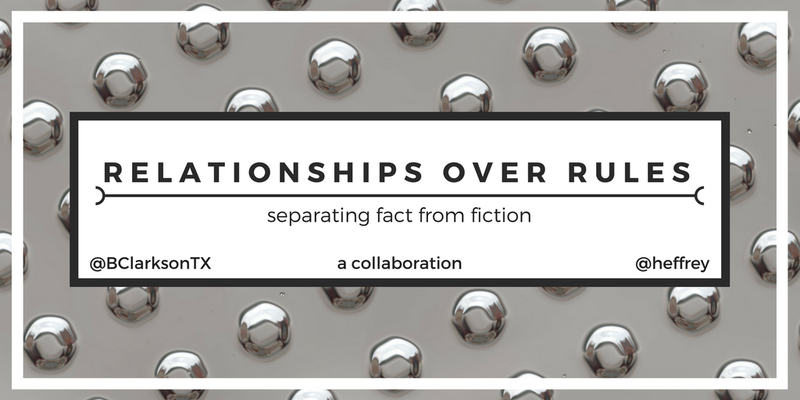 When it comes to student behavior we must separate what is fiction so we can get real about the facts. Fiction: Kids are looking to break the rules for the fun of it. Fact: Kids will test boundaries and want to see how the adults in their life will react. Tip: Be patient and extend new grace every day. All kids deserve a fresh start daily. How we respond may have a ripple effect on that kid’s future actions. Fiction: If you aren’t firm from the beginning kids will just run right over you. Fact: Kids, not unlike teachers, will follow a leader, not a war lord. You have to build credibility and know your kids. Tip: Build credibility with everyday conversations. As Aaron Hogan says in his book Shattering the Perfect Teacher Myth, “Everyday interactions are the relational foundation that much of our work rests upon.” Know kids by name, their interests, passions, and fears. It is then you understand them when they may perhaps sit across a desk from you having that much harder conversation. Fiction: Administrators are out to get kids. Fact: Administrators want to support kids with a learning opportunity when they see them make a mistake. Tip: Be on the lookout for the great things students are doing and make some noise when they do. Focusing only on what students are doing wrong will push them away. Fiction: Rules are black and white and so the consequences should be as well. Fact: When it comes to behavior and kids there is lots and lots of gray. Tip: If we truly take time to get to know our students, we will begin to understand what types of conversations and consequences will best accomplish the goal of “heart change” (rather than temporary behavior modification). Fiction: Parents are harder to deal with than the kids. Fact: As with the kids, relationships matter. We must remember that no one will advocate for their child like that parent. It is their job. Tip: Put as much focus on relationships with the parents as with the students. They are one of the most integral parts in a child’s education, especially when it comes to behavioral support. Students need a team. Fact: Kids thrive when reasonable rules are in place. Much like an unregulated game of football, daily life would feel pretty chaotic without boundaries. Tip: Put firm boundaries in place and follow through with them. Ensure that ample time is spent building relationships, especially with your more challenging students. We are not advocating that rules should not exist or not be followed for the sake of building healthy, positive, authentic relationships with our student population. We simply believe wholeheartedly that the relational piece has to play a major role in the disciplinary process. If it doesn’t, you’ll never reach the heart of any kid and the result is merely temporary behavior modification. We can do better.